I'm not sure what to call this graphic novel other than perhaps to say that on its surface, it's an absurd look at the idea of hunter and prey. But digging deeper, Hartzell has more tell the reader, and that's what makes this book work so well. With no words, Hartzell tells the story of a fox that isn't comfortable with the status quo. While getting some rabbit meat for supper, our protagonist fox watches the world with a queasy eye. His family is completely oblivious to all this, however, until a phone call tips them to his terrible secret. There's only one thing to do--send him to the fox scouts! At camp, the reluctant killer learns what to do, but still isn't very good. When faced with the rabbits, he...dances with them? That's no way for a fox to act! What if he's caught? Put to the test, is he fox--or rabbit? Fast forward many years later. The rabbits get a bit bolder, and when one particular rabbit gives our reluctant fox quite a chase. But this chase could change his life forever. Our fox is told to be one type of animal--a killer in a world where killing is what he's supposed to do, just like a boy is told he must do manly things. 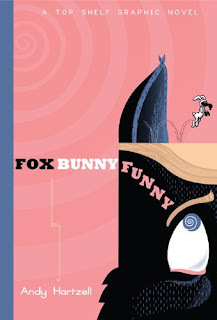 But the fox thinks he would prefer to be a rabbit, and is severely conflicted in this regard, a theme that runs the length of the story. He does all the things society wants him to do, but even without words, you can tell there is a reluctance. While others do their deeds with relish, he does them with a pained look of the person not prepared to try and dictate to society, rather than have society dictate to him. The dream sequence shows the pain of a person schooled in the way things work versus the way he wants them to work. A scene in a church brings into question the idea of acceptance. The ending, which I do not want to spoil here, opens the fox to a world that questions his worldview and quite literally blows his mind. Every scene is a nod to our world of foxes and what can happen if we allowed ourselves to let people be who they want to be instead of who we tell them they have to be. That's a powerful message in 100 pages, and if I were able to say more without ruining it, I'd go even further into that imagery. Just go read this one and think on it all night, like I did.